This place has not only been on our list, but we have stopped by a few times to check them out and it seemed like we always missed them. Too late or not open. When I saw that Carts on Foster was doing a Spam event I knew it would be a good day to check them out. Let’s be clear, I was not going to try their spam fries, I just wanted to try their burgers. I took the whole family with me on this day and 3 of us chose to try a burger. We each chose a different one. I chose the Best Burger which is a burger mixed with ground bacon, bacon strips, Gorgonzola, roasted garlic, cheddar cheese. He will also put on lettuce, tomato and onion if you want, and I wanted it. I really enjoyed this burger, but the rest of the family didn’t like it as well. The reason? Gorgonzola. 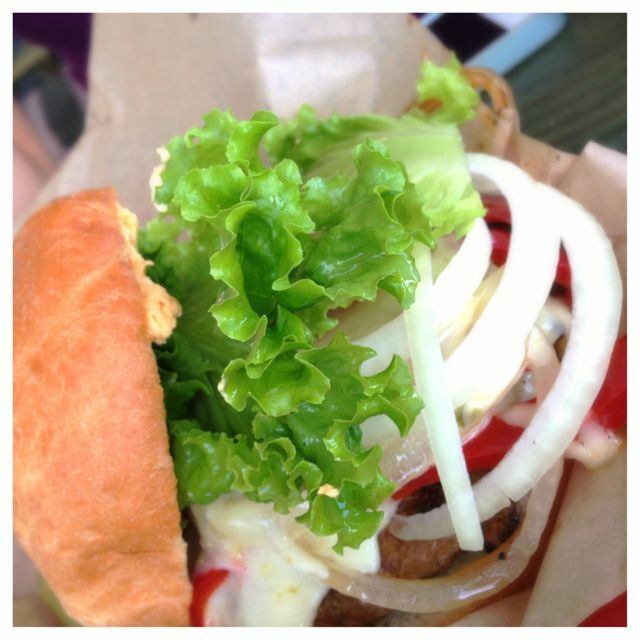 I love Gorgonzola and I thought this was a perfect compliment to this burger. If you love Gorgonzola order this burger, if you don’t there are plenty more choices for you. For instance the The Hottie with jalapeno, grilled onion and peppers, pepper jack cheese, spicy cream cheese was a huge hit. Every single one of us loved this burger. Not too spicy, tons of flavor and great combo. Probably the favorite burger out of the 3 that we tried. We also tried the BBQ burger with bacon, which we also loved. You can’t really tell by the pictures but the burgers are really large. I should have shared mine because I wasn’t able to eat the whole thing. Each burger comes with chips or you can upgrade to waffle fries, which were also really good. I upgraded even higher to portobello fries. I have never even heard of these, so I was surely going to try them. I loved these. He served them with a sour cream dip, that was a perfect combo. 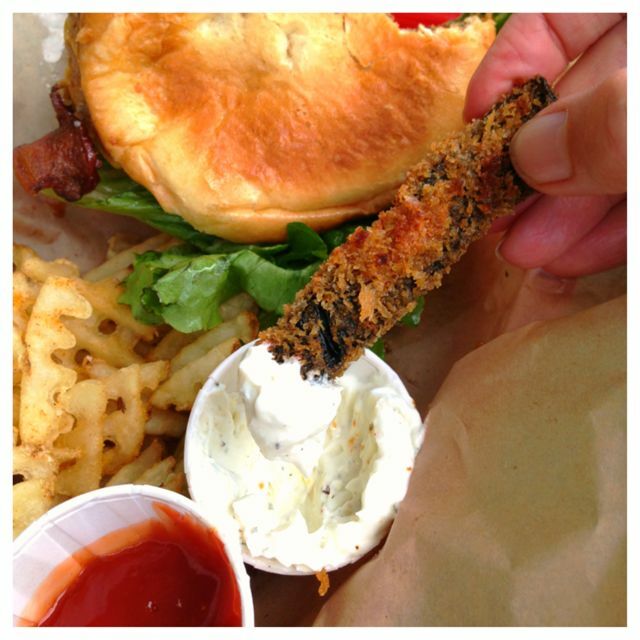 The burgers were great, but I couldn’t stop eating the portobello fries. I am so glad we finally connected our schedule with his. 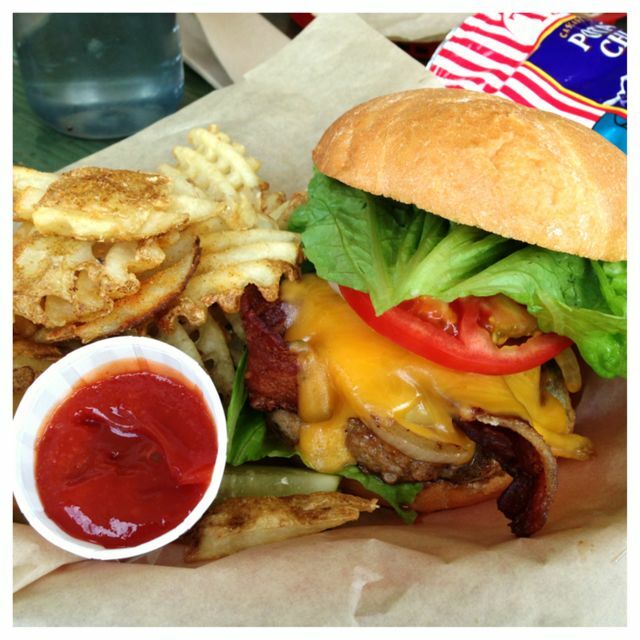 Great burgers, creative toppings and a popular cart for sure. Very creative considering on this day he was making Spam fries, but I just couldn’t do it. Atmosphere at this pod is very comfortable. They have tables sitting in the sun, some under coverings and they also have a beer place that has enclosed seating. This is a food cart pod you can go to all year long. Pricing was pretty average for a burger. They were very large burgers too. Service was great. You can see in my pic with the portobello fries that I also have waffle fries. For some reason my portobello fries weren’t getting done quick enough and he didn’t want me to wait, so he brought fries with my burger while I waited for the others. He did have a few drinks to choose from. Plus this pod also has a beer cart. 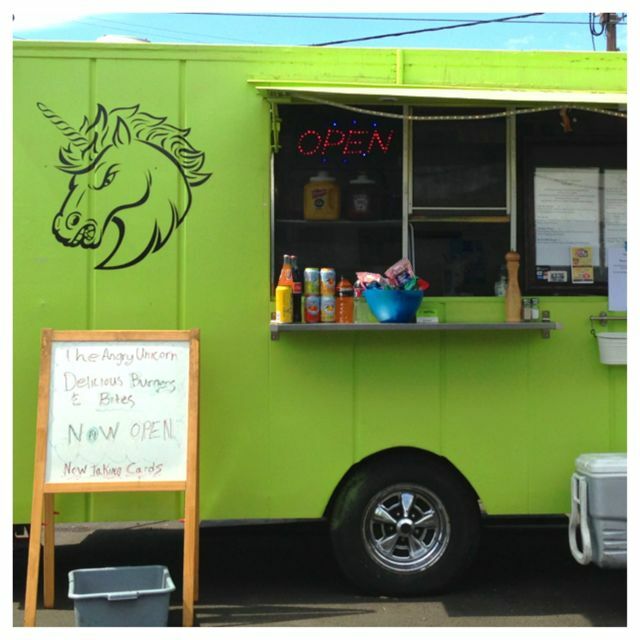 Angry Unicorn is located on Foster and 52nd. The Egg Carton – which is on my Favorites List.